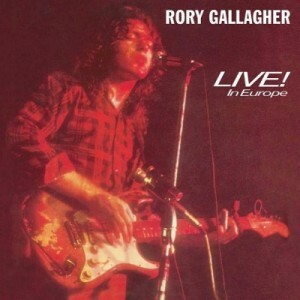 After only two studio albums Rory Gallagher released Live! In Europe in 1972, which is considered a landmark live album. Not just by the critics: the LP became Rory's first Gold record. Heavily influenced by the likes of Woody Guthrie, Bill Broonzy and Leadbelly, Rory taught himself to play the mandolin, acoustic guitar, harmonica and also mastered the slide. After discovering the electric blues of Muddy Waters he started experimenting with different styles. After his band Taste broke up (he recorded 2 studio and 2 live albums with Taste) Rory toured under his own name and recorded Rory Gallagher (1971) and Deuce (1971) with his power trio featuring bassist Gerry McAvoy (who would stay in his band for 20 years) and drummer Wilgar Campbell. Rory Gallagher won his greatest acclaim with his marathon live shows and was voted 'Melody Maker's Top Musician of the Year' in 1972 (with Eric Clapton as runner up). It's his live shows which captured the raw energy of his songs, Rory insisted, and therefore he released a number of live albums. Live! In Europe is an instant classic which seemlessly blends Folk, acoustic Blues and Blues Rock. Most definitely a must have!